Starting in 2011, I created the Galena Studio Tour group to bring local artists together to have art events to be held during the tourist season in the city of Galena. The Galena Studio Tour events are self guided art tours. We welcome customers to our open studios during these events for demonstrations, tours of the studios, and light refreshments. While at the artists studio's, you will learn something about the creative process that the artist undertakes and their personal story behind their artwork. 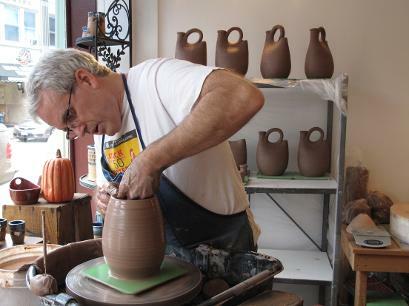 All Pinder Pottery is made in the studio/gallery. Wheel thrown pottery is made on the pottery wheels in the front window of the gallery.